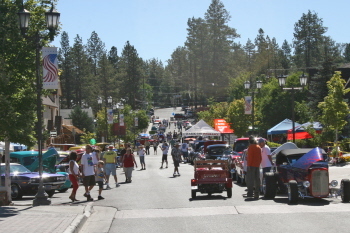 The 18th annual Big Bear Fun Run was held on August 11 & 12 in Big Bear, CA. 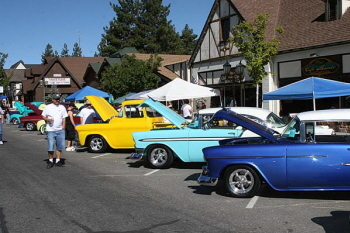 Hosted by the very capable “Big Bear Lake Antique Car Club”, the event was sold out on March 17, 2007. Yes, you read correctly, “March”! 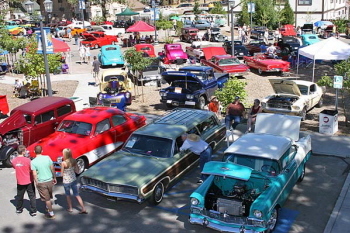 The temperature in Riverside was in the high 90’s, but up the hill the sky was blue and the temperature was a cool 80. 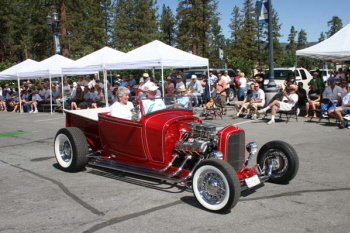 At over 8,000 feet elevation not only your body feels the thin air but so does the hot rod. The village has quite an interesting array of shops and restaurants so there was good shopping and okay food for all. 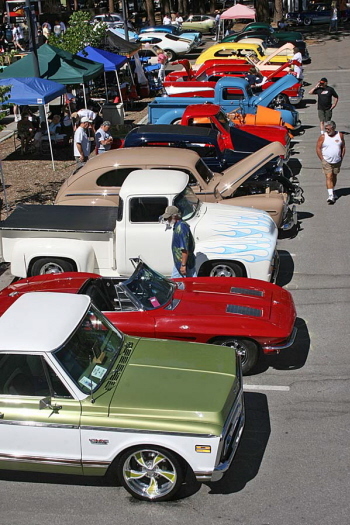 On Saturday, as usual, 500 Hot Rodders were treated to their own parking space in the village. 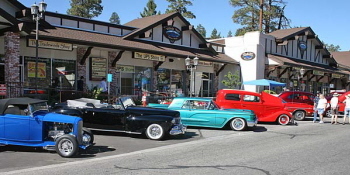 At the end of the day, all the hot rods lined up for the most amazing hot rod experience I have ever been a part of, a 10-mile drive around beautiful Big Bear Lake! 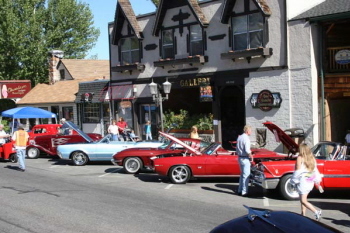 The drive was more like a parade of cars in front of hundreds of locals who came out to cheer for all the cars as though each one was a winner. Even people in boats on the lake stopped to wave. After the lake cruise, the Bartlett Street Dance kept you jumping till 10:00. The “Fun Run” ended Sunday with a unique “drive thru” awards ceremony for over sixty winners. 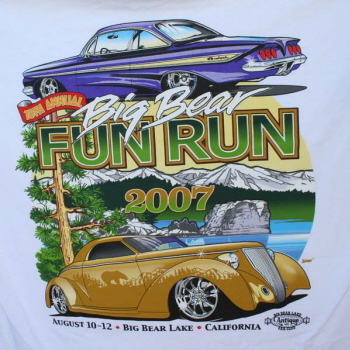 For information on Fun Run 2008, contact Cal Roe at PO Box 6311, Big Bear Lake, CA 92315. Thanks for the show! 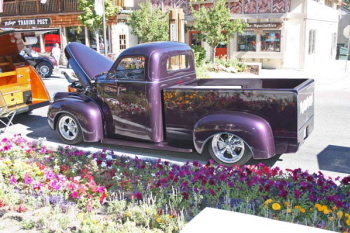 Gary & Deb Fjeldsted brought their stunning “Rudestude” ’46 Studebaker Pickup from Holtville, CA. 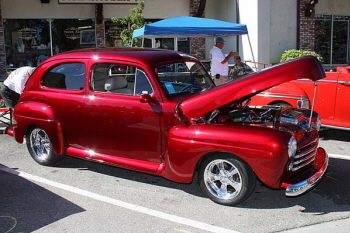 Bob & Carol Kirkpatrick are here with their custom “Candy Red” ’48 Ford Tudor from Brea, CA. 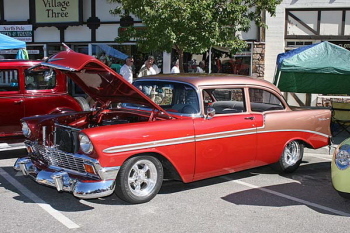 Another nice car from Lake Havasu, AZ is this ’56 Chevy Belair with “painted on” moldings. It belongs to the Schofield’s. 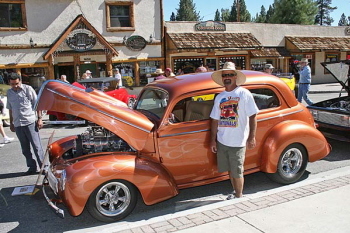 Kelly Hines from Temecula, CA stands beside the blown ’41 Willys his dad Tim didn’t get to finish. I’m sure Tim would approve of the finished work of art. Great job Kelly! 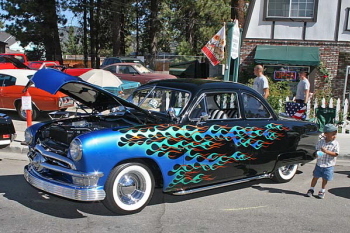 This ’50 Ford Coupe has “Got Licks”, lake pipes, ribbed bumpers, Appleton’s, and tuck & roll. 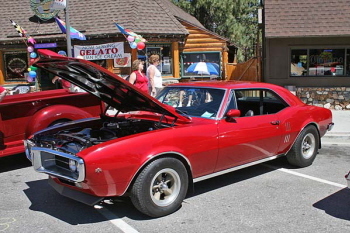 I don’t think owner Chuck Walker of Glendora, CA missed anything. Plymouth wasn’t shy with colors. 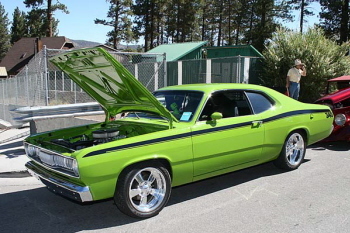 Charlie Beers ’71 Plymouth Duster from Aliso Viejo, CA. is a good example. A stand out at any show! 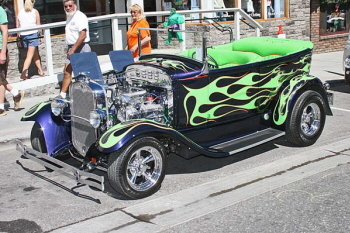 This ’30 “Tub” with dark blue paint, green flames and a sparkling small block belongs to Doc Moore of Tehachapi, CA. 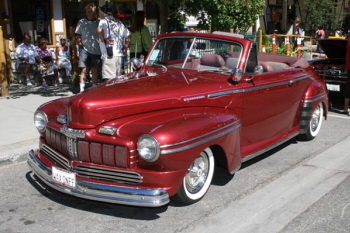 You don’t see many of these ’47 Mercury Convertibles. 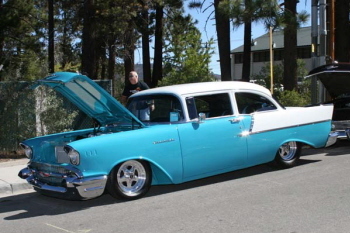 This one belongs to Vince & Linda Yamasaki of Ramona, CA. 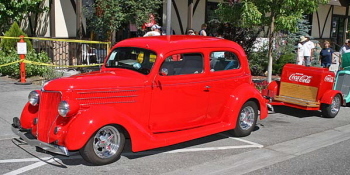 There is a hint of a popular Ford Panel called “Wax on, Wax off”? An award winner. 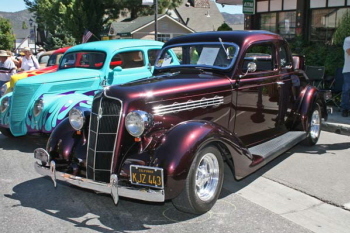 This sharp ’35 Plymouth Coupe is from El Cajon, CA and owned by Larry & Denise Hume. 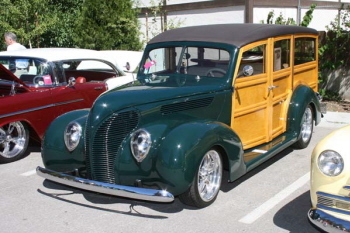 This beautiful, rare award winner is a ’38 Ford Woody and belongs to Dave Behrmann of Cota de Caza, CA. 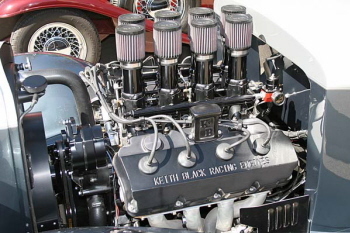 A “Mopar package”! 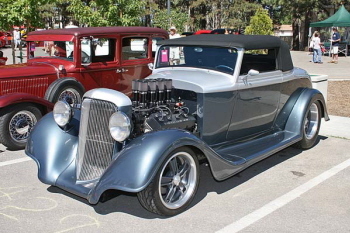 Mike Hurley of El Cajon put together a ’34 Plymouth Convertible and used an injected Keith Black for power. He captured a “Top 25” award. They put about 200 cars in this Bartlett parking lot. 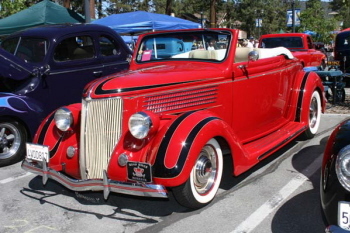 Hub caps and cool scallops make Clay Sheffrey’s rare ’36 Ford Cabriolet from Glendale, CA. stand out. 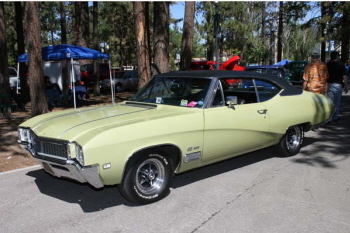 Tim West and his ’68 Buick GS400 will be taking an award home to Blue Jay, CA. 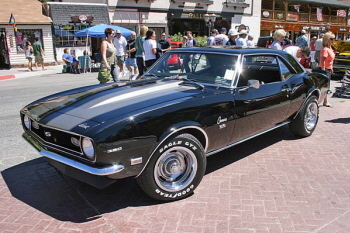 This clean ’69 Chevy Camaro from Riverside, CA. belongs to Ted Johnson. 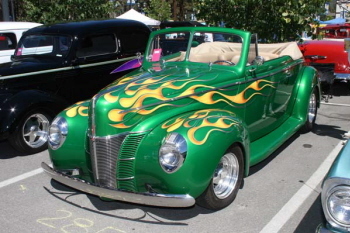 Ned Joy brought his “hot flamed” ’40 Ford Deluxe Convertible from Arcadia, CA. 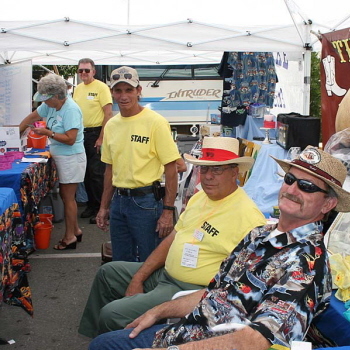 Some of the very capable “Big Bear Lake Antique Car Club” volunteers that do such a good job. 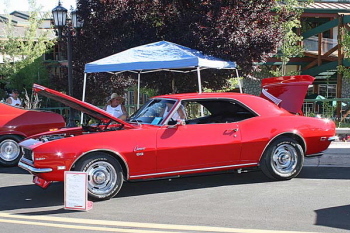 Nice stance on this ’67 Pontiac Firebird. 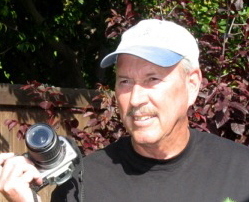 Jim Ash brought it from Yorba Linda, CA. 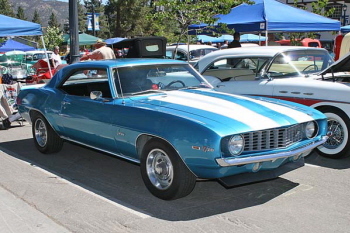 Ben Quinones moved his “68 Chevy Camaro from spot to spot till he found this one. Good choice! 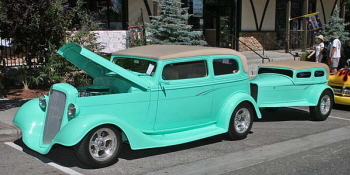 Another nice car from Lake Havasu, AZ is Bruce & Sherri Ashford’s ’35 Ford Sedan Delivery. 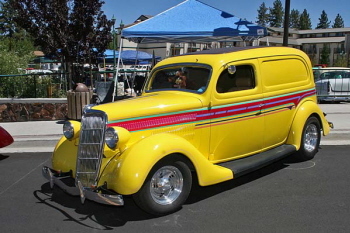 If I have one that looked like that, I’d paint it yellow! 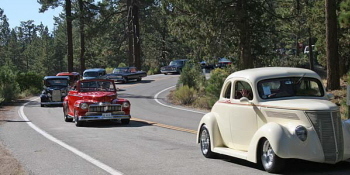 The “Fun Run” ended Sunday with a unique “drive thru” awards ceremony for over sixty winners.